According to the argument developed/explained above, what is the meaning of these details "sh'lo yaase vavin yudin .. zayinin nunin"? But Rema changes the explanation of SA 32:16, in adding הפשוטות כגון וי"ו זיי"ן או שנפסק רגל הנו"ן. The Rema is explaining, that in contrast to the hai [mentioned prior – 32:15] that its shiyur for a short foot is כמלא אות קטנה a yuds length, in regard to a vav zayin etc. this shiyur is not sufficient, the shiyur instead is – the reading of a tinok. Some understand the Rema as changing the dimension of shiyur haois, from exact measure given for the hai, reversing back to the SA opinion. IE, any change of the vav yud zayin nun is determined only by a tinok, either lchumra or lkula (any example given later for the SA opinion will fit here also). To my understanding, this seems to be the MB stand in this issue. 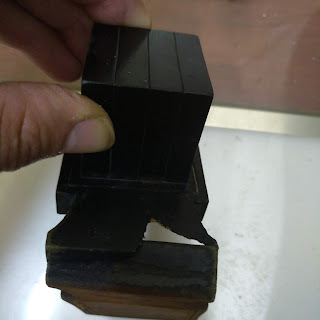 A. the vav must be long so as not to resemble a yud, but whats the problem with a short zayin? It doesn’t resemble another letter? B. Why did the Rema single out "or the nun [pshuta]" (see the MB 32:47)? 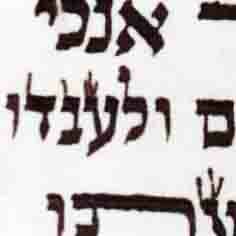 C. What is the meaning(נפסק) אחת מהאותיות הפשוטות "one of the simple letters"?? (true that these questions each may be resolved, but the altogether meaning of the Rema and his intention are obviously different). The Shulhan Aruch Harav (and this is quite accurate in the Mordehai – source of this psak in Rema) 32:20 explains: the simple letters that have only one foot (in deference to the hai or dalet). The Rema is saying, that for group 3 hai dalet etc. the shiyur of their feet is 'mloi ois ketana', but for group 2 this isnt enough, since their basic dimension is a line, a 'mloi ois ketana' alone would change their dimension of a line, turning them into a dot [a yud]. Therefore their foot must be longer than the yud so they are called an ois pashuta, if not they are not an ois p'shuta only a yud by definition. This follows the general theme explained in Rema above, that the letters require - above and before recognition of a tinok - basic measures. The basic measure of a vav and a zayin is that their regel be longer than their head, ie kulmus +, one kulmus exactly in their foot makes their foot a mloi ois ktana alone, they are a yud by definition. The Zayin pointed out in mezuza no. 2, accordingly is pasul, because the rosh and regel are equal, losing its basic dimension of being a kav, now it’s a nekuda [a large yud type]. The Pri Megadim quoted by Biur Halcha 32:16 דיבור המתחיל כגון וי"ו וזיי"ן is in doubt in regard to a short foot of zayin, should we follow a shaylas tinok and obvious a tinok will defer it from a yud not because its foots length, but because the special shape of the rosh, or this is not sufficient. His doubt is understood as how to understand the Rema as I wrote above (the MB understanding, or the SH Harav). If a shaylas tinok is enough as definitly the opinion of the mechaber; then the zayin in the mezuza probably would be kosher, because a tinok would recognize it. This explanation in Rema's shita, explains also why he includes a nun pshuta – the nun in deference to a vav or zayin, is in its length. They are twice the length of a yud, the nun three times. Even if in regard to a long zayin or short nun one may consider it doesn’t matter which shita you follow, the SA or Rema (although there definitly would be a nafka mina, if the nun has a thick head as the zayin in question above. 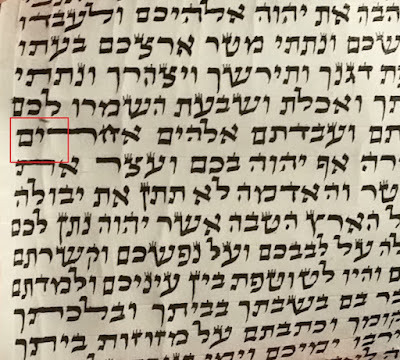 If we follow shaylas tinok as the SA shita, it may be kosher because it extends under the line, but according to Rema it is a large zayin, and is pasul for nun) but the big nafka mina is a long vav!! Many Rabonim hold that a long vav (3 and 1/2+ kulmusim, clearly extending under the line) is kosher, because the vav is different than a nun pshuta in the tzura of their head, so therefore a tinok would not mix up between a vav and a nun pshuta. To my opinion this is correct only for the SA shita, but as the Rema's shita (as explained) this is pasul - a long vav is a nun pshuta, because it extends out of the measure of the ois, not because a tinok will call it a nun. A. according Rema the minimum measure of the foot of vav or zayin are more than mloi ois ktana . 1 kulmus alone is definitly pasul, only if longer than that, may occur a shaylas tinok. B. according Rema a vav longer than the line (aprox. 3 and 1/2 + kulmusim) is not a shaylas tinok, but pasul, because it has the dimension of a nun. After explaining the Rema [according to Shulhan Aruch Harav] we come to another question, that isnt clearly written in those sources: Does the regel of the yud have any requirement in regard to its length? The common sense dictates, just as the vav or zayin must have a minimum length in order to be a ois pshuta, and a maximum length not to become a nun pshuta, so the yud has a definition of measure that defines it as yud [a nekuda = dot] and not an ois pshuta [kav = line]. This is the gmara "sh'lo yaase vavin yudin yudin vavin" – just like one may not shorten a vav making it a yud, one may not lengthen a yud making it a vav. This equation is not in regard to a shaylas tinok (as explained according to SA), but in regard to their basic measures. Therefore 'mloi ois ktana' is itself the definition of the measure of a yud, not merely a minimal measure for the yud and the foot of the hai. The shiyur of a yud is ois ketana = a dot, this is the guf of the yud. Adding a foot longer than that [more than 'mloi ois ktana'] to this guf, automaticaly turns this letter by definition into a vav/ois pshuta. Again, according to Rema's shita a change in the basic measures are not up to a shaylas tinok, but are definitly pasul as shinui tzuras ois. Yud the head is dominant, and the regel less than the width of the head = less than a kulmus. [I know the Mikdash Me'at learns in Alfa Beisa that the shiyur given for a yud 1 kulmus, is meant for its regel. Putting le'chatchila the regel of the yud at 1 kulmus. I disagree and think he is mistaken in understanding the Alfa Beisa – the AB is mentioning the mlo ois ketana shiyur as above – the guf of the yud must be 1 kulmus, the foot is not mentioned because it doesn’t have the law of mlo ois ketana like the regel of hai, IE it doesn’t have a shiyur at all, it is only a kotz not a measure]. Bdieved a yud that its regel and rosh are equal is a shaylas tinok how to read it. So, a yud that its foot is longer than its head, or its head is not a mlo kulmus, according to SA it is a shaylas tinok to define what the letter is, according to Rema both are pasul. I think although one should definitly machmir like the Rema's opinion, we may lechatchila be leniant in fixing these yudim [by adding ink to adjust the correct porportion of head/foot] as long as a tinok did not pasel them. If a tinok could not read them correctly, they are not a yud at all, and fixing would be shlo csidran. But if a tinok can read them (so they are kosher according SA and possibly according MB) at least they may be fixed even after writing the rest of the parsha. See MB 32:40. Baruch Hashem I finished this issue [the common problem of yudim]. What I have written does not cover the complete scope of the issue. There are more and deeper differences between these 2 general shitos….